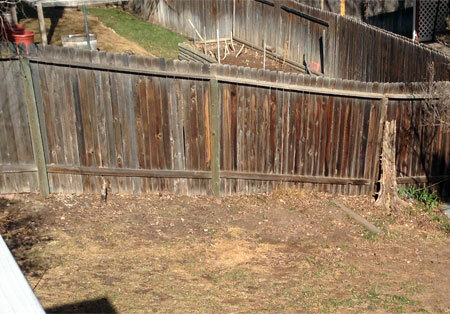 I grew up in Littleton, Colorado with soil that was all clay. I literally remember picking up chunks of clay from our backyard as a child and molding shapes out of it. Clay soil is a pain to cultivate in because it is so dense and sticky that even turning the soil is an exhausting process. Fortunately, that is not our problem at the new house in Colorado Springs. Theo was born on Mother’s Day last year, which is the frost-free date for planting in Colorado. 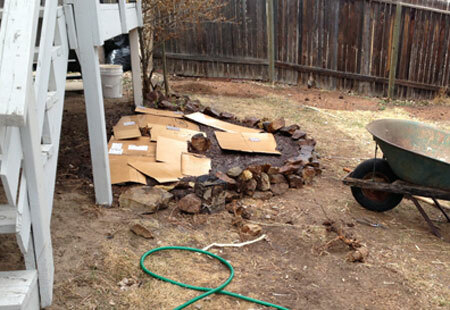 Needless to say, I did not get any yardwork at all, much less gardening, done last summer. So this year I have my hands full. 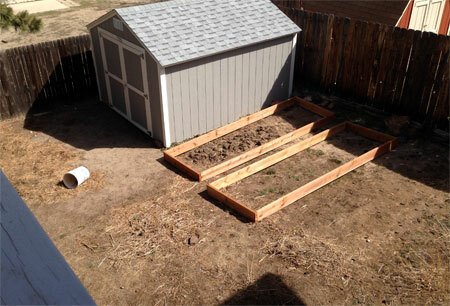 The big challenge with the soil here is that Colorado Springs is considered a “high desert”–my backyard literally looks like a sand box! Also, because of the high elevation, we have a relatively short growing season. For me, these factors suggested that raised beds would be the way to start if I was to have any hope of successful vegetable gardening. My backyard slopes down and faces north, and the sunniest spot in the yard is unfortunately taken up by several large pine trees, so I had limited options for placing beds. I calculated that I would be able to put in two 4’x12′ beds in a sunny corner of the yard that gets about 8 hours of direct sun daily. I recruited my dad’s help putting together the beds. Notice all the lovely dead grass turning to dust. 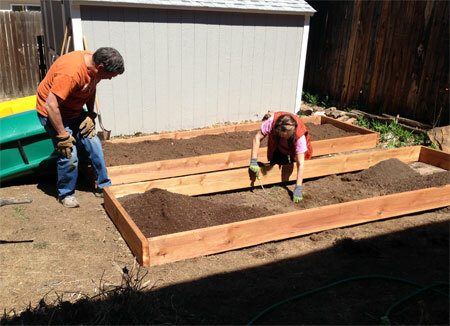 This weekend, with gorgeous 70F weather and the promise of snow in a few days, we set about finishing the raised bed project. My parents took a trip up to Hazel Dell Mushrooms in Fort Collins with a friend of theirs to pick up a load of mushroom mulch, which amounted to enough to share between 3 home gardens for $30. But more on that in a post to come. 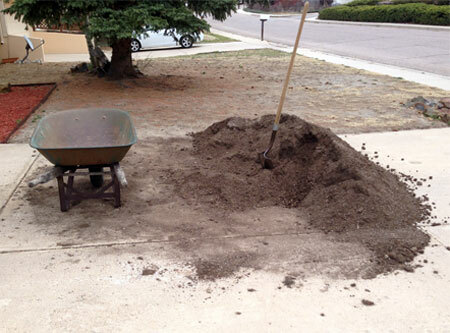 We also had a pile of garden mix soil (topsoil, humus, cow manure, perlite and a few other components) delivered to my driveway from Don’s Garden Shop on Platte. Then it was a matter of filling the beds with layers of soil and mulch, watering as we went to make sure there were no dry spots in the beds. 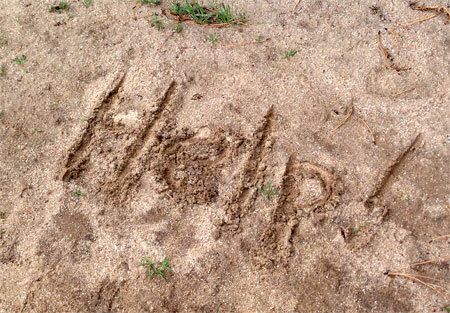 This represented several hours of wheelbarrow trips, after which the pile of dirt was still disconcertingly large. We started looking around for more places to put all that soil. 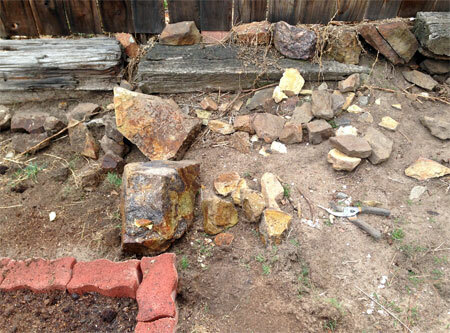 Our backyard is full of random piles of landscaping rocks and bricks that were never used by the previous owners. 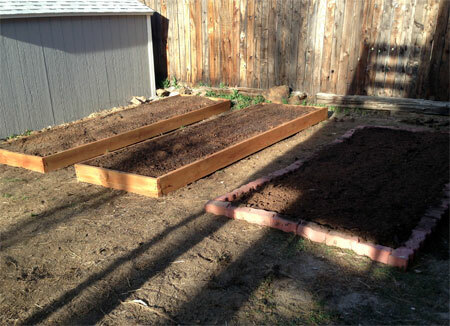 After filling our two big beautiful raised beds, there was easily enough dirt to fill another bed, so I had the brainstorm to outline one in brick and make a low bed in a partially shaded area for growing greens like lettuces that would be likely to bolt in full sun. This worked out great except that there turned out to be a rock pile buried under half the bed, so we spent the end of the day not only carting bricks but digging up huge rocks like so many potatoes. After all that, there was still a ton of dirt left, so I decided to amend the soil along the fence on the other end of the yard, which gets morning and mid-day sun, and was currently a terraced bed of dirt and rock with no purpose. 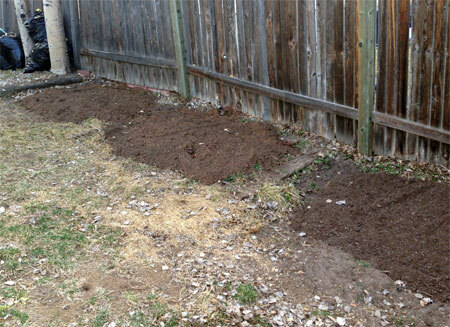 After raking up yet more rocks, we amended the beds with soil and mulch, and I hope to use these plots to grow zucchini and rhubarb. After all of that, at least a quarter of the dirt pile was still in residence on our driveway. 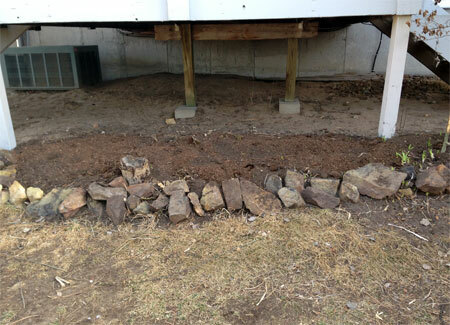 We fished more rocks out of a mostly empty bed at the base of the back porch and added some dirt to that. Then we finally called it a day. I spent the night dreaming about putting in an herb spiral, and when I got up the next morning, I realized that the bed by the back porch was probably the best I could do for location. 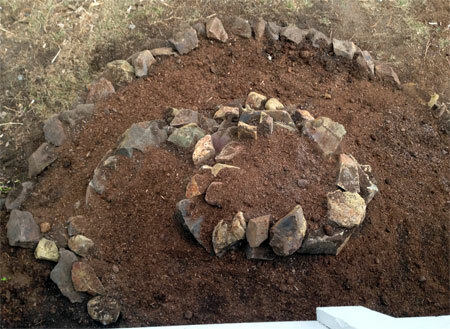 By this point, my parents had gone back to Littleton, so I ended up tackling the herb spiral project all my myself. I expanded the shape of the bed farther out into the yard and built up a wall of rock in order to start with a flat bed surface instead of a hill. The cardboard visible there is a weed barrier; the bed was full of tiger lilies, which seemed to be the only thing anyone had ever planted in our yard, and although I dug up as many as I could, I think I still missed a lot of bulbs. 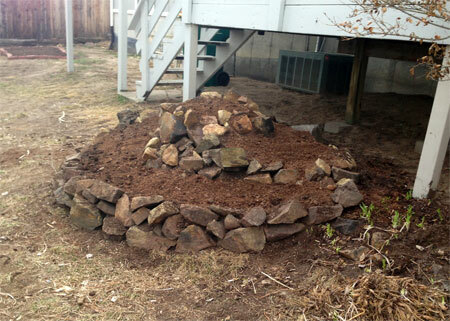 I also had to dig out an aspen weed tree, but I left the bigger stump and figured I would just build it into the inner spiral. This is the finished bed, after pretty much a full day of labor. It isn’t perfect and the location isn’t ideal, but I am pretty pleased with it on the whole. Definitely used up a lot of soil and rocks! It is supposed to snow tomorrow, so I finished all of this just in time. While the weather is not cooperating, I can start mapping out where all the plants will go in my new beds, and I should be able to start planting a few cool season crops like greens and peas and potatoes next time we have a warm spell. The herbs will mostly have to wait for the frost-free date. And now I am going to go move as little as possible for the next couple of days!